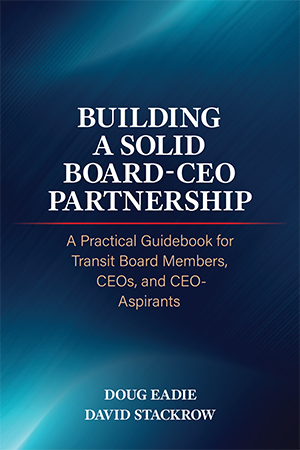 Over the past quarter-century I’ve learned that the public transportation authorities that are really good at getting significant, out of the box innovation and change accomplished are invariably led by a CEO who is passionately committed to playing – and well prepared to play – what I call the Chief Innovation Officer role. The CEO is the only person in your authority who can wear the Chief Innovation Officer hat for the simple reason that no one else brings to the change game the formal authority, influence, access to resources, and time required to spearhead an out-of-the-box innovation effort and to overcome the inevitable inertia and resistance that can sink a change ship early in its voyage. 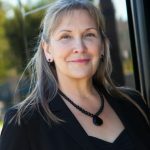 Donna DeMartino, Chief Executive Officer of the San Joaquin Regional Transit District, is a Chief Innovation Officer Extraordinaire, as the podcast she recorded earlier this week for boardsavvytransitceo.com illustrates. She is also, by the way, at the helm of an authority that APTA has designated a 2018 Outstanding Public Transportation System. Donna’s podcast tells the story of a major innovation initiative implemented on her watch at RTD, in close collaboration with her Board members, who are ardent Change Champions: the Regional Transportation Center. If Donna were not such a passionate visionary, this handsome new state of the art maintenance facility – replete with a fitness center and bistro featuring healthy entrees – almost certainly wouldn’t have come into being. And if she were not such an aggressive, open-minded innovator, RTD wouldn’t have saved an estimated $1 Million in design fees by adapting the facility design of another transportation authority. Donna also brings a rare enterprise mindset to her work as RTD’s Chief Innovation Officer, witness the fact that RTD’s Regional Transportation Center is generating earned income through contracts to provide vehicle maintenance services for a variety of public/nonprofit agencies in the region. Are technically very knowledgeable about best practices in the rapidly changing area of change planning and management, which means they aren’t wedded to conventional planning wisdom and out-of-date approaches. You’ll never hear a change-savvy CEO extolling the virtues of traditional long-range (or “strategic”) planning as a change tool, much less catch her fondling a ten pound five-year planning tome. Realize that successfully bringing off out-of-the-box change against all odds requires that they make leading the change planning and implementation process a top-tier priority. In practice, this means that the change-savvy CEO makes a firm commitment of time to leading change from the top, and never tries to delegate one piece or another of this leadership role to lieutenants. Recognize that leading out-of-the-box change as Chief Innovation Officer of their transit authority is as much psychological and political in nature as technical. Not only does the change-savvy CEO understand that fear is more often than not at the heart of staff resistance to change, she also takes strong, visible steps to allay that fear, for example through the clear articulation of vision and other motivational steps that are intended to inspire and energize participants in the change process. The change-savvy CEO also pays close attention to the transformation of key stakeholders into ardent Change champions. And command the respect of board and staff members and key stakeholders, primarily by playing a very aggressive and visible change leadership role and practicing what she’s preaching in the change arena. A change-savvy CEO knows that her leadership credibility depends on “walking the talk,” never contradicting in practice what she’s saying publicly.